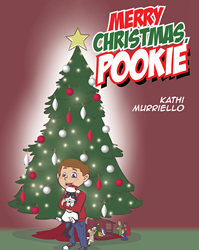 “Merry Christmas, Pookie” from Christian Faith Publishing author Kathi Murriello is a fun picture book about a cat named Pookie who finds a way to be involved in all the holiday chores and festivities in preparation for Christmas. “Merry Christmas, Pookie”: a delightful story of a cat’s holiday, is the creation of published author Kathi Murriello, a married mother of two from Brooklyn, New York, now residing in Tucson, Arizona. She has a talent for the fine arts and a heart for writing children’s stories. Murriello writes, “Merry Christmas, Pookie is the second in a series of Pookie and Joey books. “The Miller family is getting ready for Christmas. In the spirit of the holiday season, five-year-old Joey wants to help his parents with holiday chores. However, he doesn’t want to exclude Pookie, the family cat, who is also his best friend. He wonders what Pookie could do to help so she can enjoy the holiday too. The family has fun working together to make it a very festive occasion. They have consideration for one another and, at the same time, bring joy to others. Published by Christian Faith Publishing, Kathi Murriello’s new book is an entertaining glimpse into the life of a loving Christian family as they find ways to make sure that Christmas is a time for everyone. View a synopsis of “Merry Christmas, Pookie” on YouTube. Consumers can purchase “Merry Christmas, Pookie” at traditional brick & mortar bookstores, or online at Amazon.com, Apple iTunes store, or Barnes and Noble. For additional information or inquiries about “Merry Christmas, Pookie”, contact the Christian Faith Publishing media department at 866-554-0919.